I mentioned in my previous posts that I’m surrounded by family from past few weeks. Last Friday, the 13th was husband’s birthday. His folks were in town for the celebration. Yaay! So as you must have already guessed, I was going to bake the birthday cake myself. 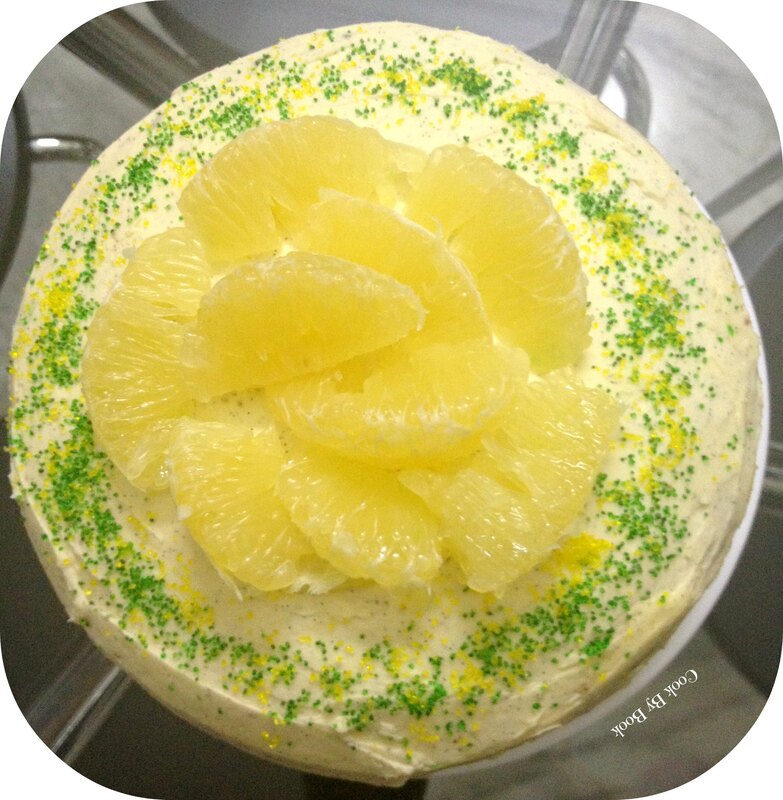 I asked him what flavour he would like this year and without thinking much he said I want lemon… And I was like, lemon cake?! Really?!! I made every single element on this cake on same day. If you do not have such a luxury of time then I suggest you make cakes a day before and refrigerate them individually covered in clingfilm until you’re ready for assembly. Make filling and frosting just before assembling the layers. This will certainly cut down on waiting time as the cakes would be cool and ready for the assembly the next day. So let’s get on with the recipe! *Please pardon the pictures as the only chance I got was couple minutes before the celebration! Preheat the oven to 180°C / 350° F. Butter and flour the edges of 3 6-inch round cake pans and shake out the excess. Set aside. Line the bottoms of the pans with parchment paper. In a medium mixing bowl, whisk together flour, baking powder, baking soda and salt. Set aside. Add the butter to the large bowl and prepare electric hand-mixer or electric stand-mixer fitted with the paddle attachment. Add the lime zest to the bowl with the butter. Beat on medium-high speed for 3 minutes, until light and creamy in color. Scrape down the sides of the bowl and beat for another minute. Add the sugar to the butter mixture, ¼ cup at a time, beating 1 minute after each addition. Add eggs, one at a time until incorporated. Scrape down the sides of the bowl after each addition. Combine yogurt, sweet-lime juice and vanilla extract in a liquid measuring cup. With the mixer on low speed, add the dry ingredients alternately with the wet ingredients, beginning and ending with the dry ingredients and mixing just until incorporated. Scrape down the sides of the bowl and mix for 15 seconds longer. Combine the cream cheese and butter in a bowl of an electric mixer. Beat on medium-high speed until smooth and well combined. Mix in icing sugar and beat on low speed until incorporated. Blend in lemon juice and sweet-lime zest. Increase the speed to medium-high and beat until light and fluffy, about 2 minutes. Transfer the mixture to a medium bowl and set aside. Wipe out the mixer bowl and fit with the whisk attachment. Add cream to the bowl and whip on high speed until stiff peaks form, being careful not to overbeat. Mix about a third of the whipped cream into the cream cheese mixture to lighten. Gently fold in the remaining whipped cream until no streaks remain and the mixture is evenly blended. Add butter to the bowl of an electric mixer fitted with the whisk attachment. Whip on medium-high speed until smooth, about 1 minute. Add icing sugar to the bowl and mix on medium-low speed just until incorporated. Scrape the seeds from the vanilla bean pod into the bowl and add in the salt. Continue to beat on medium-high speed until smooth, about 1-2 minutes. Mix in the vanilla extract and whipped cream on low speed just until incorporated. Increase the mixer speed and whip on high speed until light and fluffy, scraping down the bowl as needed, about 4 minutes. Level cake layers if necessary. 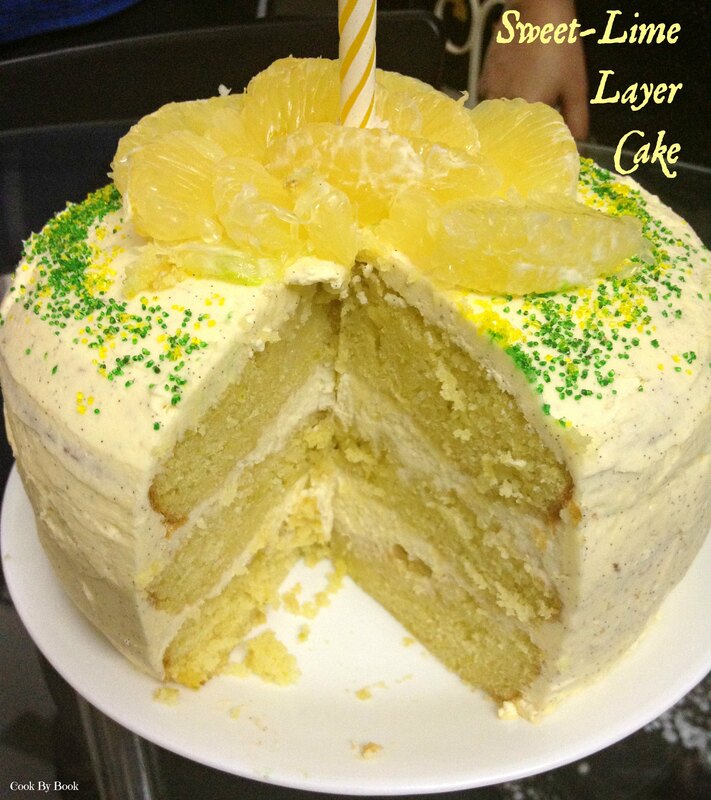 To assemble the cake, place one of the layers on a serving platter. Top with half of the cream cheese filling and smooth in an even layer. Place a second cake layer on top of the filling and top with the remaining filling. Place the final cake layer on top. Frost the top and sides of the assembled cake with the vanilla bean frosting. 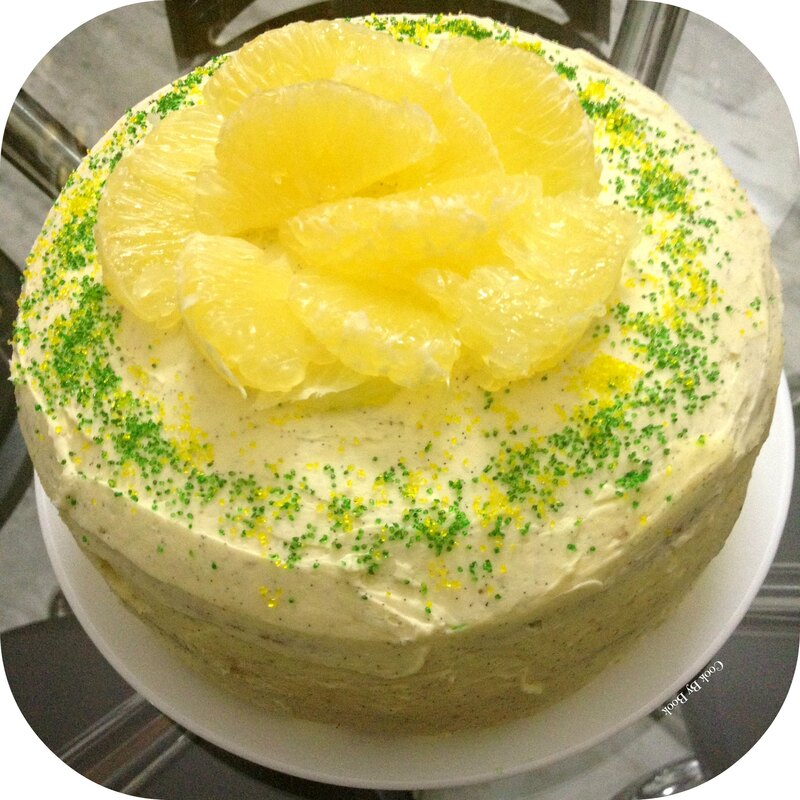 Sprinkle some yellow and green colored sparkling sugar around the 1-inch border of the cake. Garnish the centre with the sweet-lime slices. 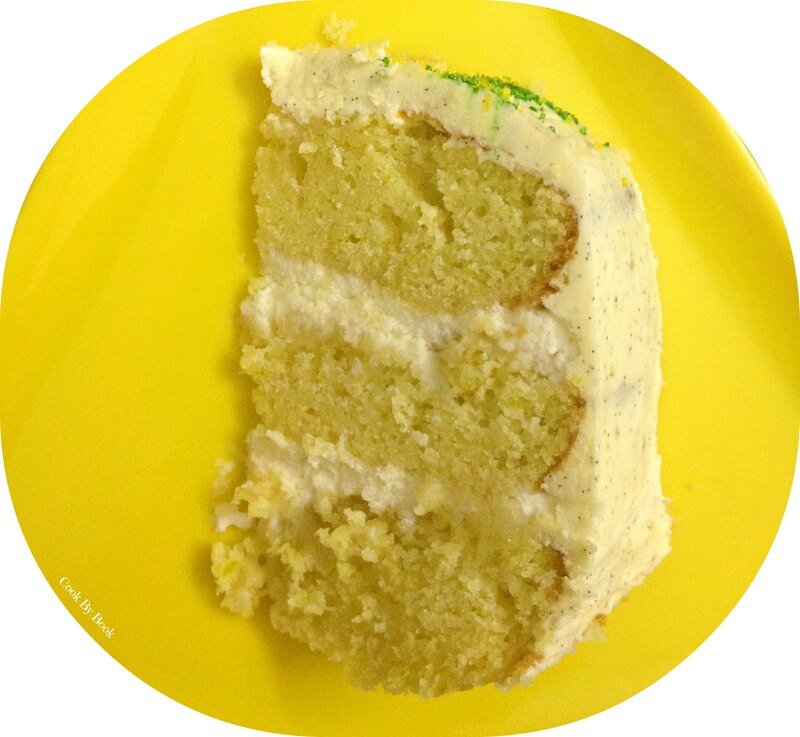 To make the frosting look whiter, use white unsalted butter and clear vanilla extract. I am drooling over this cake now. Got to try this weekend . Thank you! Thank you so much for a lovely comment Namrata! Happy birthday greetings to your husband, this was wonderful treat!